I am creating a questionnaire in a modal based interface, where there are three buttons. Next - saves, and bring in the next question template. Previous - saves, and bring in the previous question. Save - saves the questions, and closes the popup. I am afraid the user will have no idea that the Next/Previous buttons are actually saving their questions before taking them back and forth. And what if my user keep clicking save, before clicking next/previous? Also, another functionality that 'save' has is that after saving, it is auto closes the popup. One option is to call it 'Save and Close', but how do I reassure my user that everytime they click Next, or previous, their questions are indeed getting saved. Save should most certainly be Save & Close/Exit. Save is a long established interaction and most of the users will expect for the form to be still opened after pressing save. I don`t know the whole idea behind your project but why would a person go back & forth through questions? I worked on a similar project and we ended up with having all the questions on a single page with a "+Add Question" button with a Save button and also a Save & Close button but it might not apply for your scenario. When designing interactions on the UI it is important to make sure that the user understands the effect of the actions. provide a permanent label that people may not read. So basically you have to try and make the design clear, consistent and tailored to the user's expectations. There is no 'best' solution here, just what you think is going to work well, and you may have to experiment to see what works best. Just to propose another perspective from the previous answers, consider implementing an auto-save functionality. 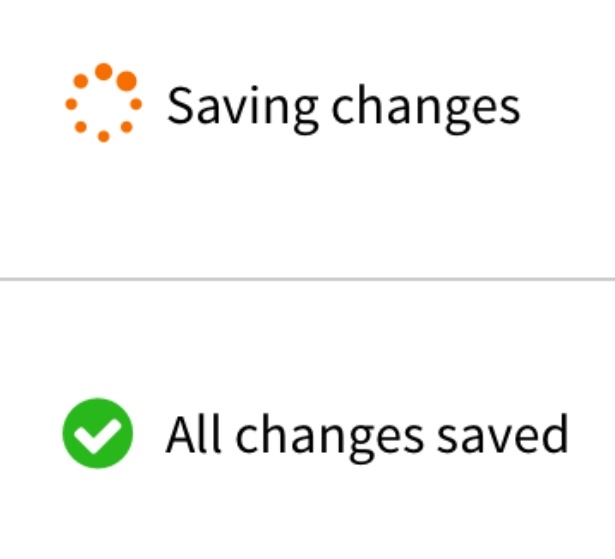 It would constantly show a loading wheel and “saving...” label that turns into a checkmark with a “all changes saved” label. This way your interface does not get in the way and is simplified by implementing a close button only. The user does not have to worry about whether their inputs are saved or not, they should be worrying about inputing their questions. They would perform an enter answer / next question / enter answer action and close when ready. Rather than entering answer, having to remember to save, worrying about whether it will be saves when clicking next, etc... The task in the second scenario is simply replete with system / interface worries rather than the primary task of entering their info. Not the answer you're looking for? Browse other questions tagged buttons labels questionnaire or ask your own question. Should one put labels on Previous / Next buttons? Where to place a button that allows users to jump between process steps?